Absolutely no one likes cleaning another's urine or waste off a seat before use. Now, a product has finally been invented that will significantly improve bathroom/lavatory hygiene. ASC Elite Seat is a division of ASC International and was created to introduce our newest product, the ASC Elite Seat - a self lifting toilet seat. We are keenly interested in public health issues. We have long been concerned about what could be done to solve the problem of dirty toilet seats, especially now with such dreaded diseases as SARS, bird flu, Ebola, and other bacteria/viruses which may possibly be transferred through moisture, droplets and bodily fluids. As such, toilet seats which are contaminated even with small amounts of urine, blood, feces, and/or spit - may play a role in the spread of disease. Our sister division is ASC Hygiene the company that created the complete touch free restroom featuring the CWS Cleanseat, the world's first self-cleaning toilet seat. It was determined that not all business can afford the CWS Cleanseat, but there was a need for another solution. Our market research also has determined that consumers wanted an affordable solution for home. Dirty toilet seats are as ubiquitous as inconsiderate people, and absolutely no one likes cleaning another's urine or waste off a seat before use. Our engineer friends have solved this problem by designing a unique product which will significantly improve bathroom/lavatory hygiene -- the self-lifting toilet seat. Our seat does not use gears, springs, motors, or pedals. Rather, we make clever use of physics and the principle of fluid secondary equilibrium. Once the seat has been put down, it will begin to smoothly and quietly return to its' original upright position in 45 seconds. There is no need to reposition the seat after use. 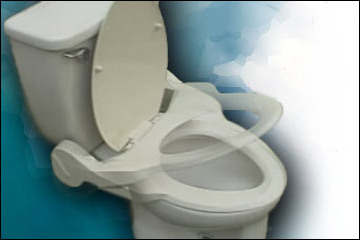 We are aware that some people feel that a toilet seat should always be kept in the "down" position. But unfortunately, we do not live in an ideal world, and toilet seats are still unsanitary! ASC challenges conservative concepts about toilet seats and re-enforces our basic premise that practical toilet seat hygiene is long overdue. Perhaps the most unique and spectacular point about our self-lifting toilet seat is that it is in complete harmony with ancient Chinese Philosophy. Rather than argue about the "up or down issue," or verbally demand that a man urinate sitting down, or try to change things in a less-than-ideal world...our Elite Seat simply gets itself out of the way, and as such, is no longer a "target." Besides "getting out of harms way," it is damp-proof and resistant to staining by urine. Our self-lifting toilet seat also has silver nanotechnology in the seat material for anti-bacterial effects - helping it to stay fresh and clean. To learn more about the ASC Elite Seat, visit http://www.asc-cleanzone.com. ASC is also seeking dealers for their Elite Seat in North & South America, Africa, and Europe.